However, there are a few occasions where Connery’s 007 sartorially overlapped with Fleming’s vision. His dark blue suit when visiting Osato’s Tokyo office in You Only Live Twice thus serves as an appropriate post for the 00-7th of May, Ian Fleming’s birth month. This is some of the closest that Connery’s Bond ever came to Fleming’s sartorial vision for 007, even down to the “thick comma” of hair above his eyebrow. For his meeting with Osato in You Only Live Twice, Sean Connery wears a lightweight wool suit in dark blue, not quite navy, that comes the closest of all of the Connery Bond suits to Fleming’s sartorial vision. Connery’s single-breasted suit jacket is also distinctive for its single-breasted front. This would be the first appearance of the then-fashionable single-button closure on a non-dinner jacket for Bond (Roger Moore would later wear a single-button jacket with his cream summer suit in Moonraker and Pierce Brosnan’s striped charcoal three-piece suit in The World is Not Enough also had a single-button front.) The single-button also reflects the minimalist simplicity of Fleming’s Bond, although the author never stipulated just how many buttons were on the front of Bond’s suit jackets. The single-button closure is perfectly placed at Connery’s natural waist for a flattering fit as Connery’s midsection started to expand. The suit jacket remains otherwise consistent with the details we expect from Connery’s beautifully tailored “Conduit Cut” suits from Anthony Sinclair: the narrow notch lapels, natural shoulders with roped sleeveheads, and a full chest with a suppressed waist. The straight hip pockets are flapped, the welted breast pocket has no pocket square, and both sleeves have four buttons spaced on the cuffs. Bond checks out Osato’s distinctive office decor. The elements of Connery’s trousers that have followed him since his first “Conduit Cut” suit in Dr. No were less stylish by 1967, particularly the pleated front and the cuffs. 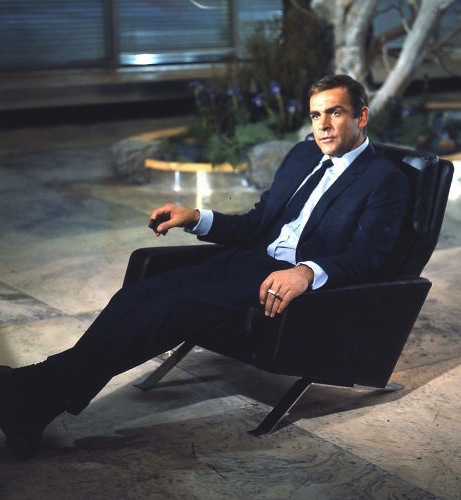 Despite the fashion-forwardness of his jacket, Connery still retains these more traditional elements on his double forward-pleated suit trousers in You Only Live Twice, with the same tapered leg, cuffed bottoms, and three-button “Daks top” side adjusters that we associate with the Connery Bond of the ’60s. A rough day at the docks for 007. This suit would be the last appearance of Connery’s traditional pale blue shirt and navy silk tie that had been a staple of his 007 look since Dr. No in 1962. The poplin shirt from Turnbull & Asser has a spread collar, front placket, and two-button turnback cuffs (or “cocktail cuffs”) that Connery’s Bond popularized. Straightening his tie, adjusting his cuffs… Bond always finds time for a wardrobe adjustment after a major action sequence. Connery’s slim solid silk ties in the ’60s alternated between grenadine ties (in Dr. No, From Russia With Love, and Thunderball) and knit ties (in Goldfinger and You Only Live Twice); his silk knitted tie in this scene is navy, a shade darker than the blue of his suit and certainly evocative of the “thin black knitted silk tie” described in Fleming’s novels. Composed and cool in Osato’s office. In Moonraker, the third of his Bond novels, Ian Fleming described Bond’s “black moccasin shoes.” The closest that Connery’s Bond ever came to this casual footwear are these black grain leather slip-on shoes that he, appropriately enough, wears with this Fleming-esque blue suit in You Only Live Twice. Though the shoes’ plain toes prevent them from being true moccasin-style loafers like Fleming had envisioned, they certainly reflect the same comfortable, informal spirit of a man who “abhors shoe laces” (as we learned in On Her Majesty’s Secret Service). Connery wears black ribbed dress socks with his loafers. Bond holds his feet to the fire. He also carries a navy felt trilby into the meeting but never actually wears it on his head. Much like You Only Live Twice broke from Bond tradition by never featuring the hero wearing a tuxedo or behind the wheel of a car, it was also the first of the official films to not prominently feature Bond’s wristwatch. Connery’s Rolex Submariner had indeed received prominent screen time in Dr. No, From Russia With Love, Goldfinger, and Thunderball. Here, barely glimpsed under his left shirt cuff, is the Gruen Precision 510 dress watch that Dell Deaton identified on his informative site, James Bond Watches. For more about this suit and outfit, check out Matt Spaiser’s blog post on The Suits of James Bond. Hey, that’s no Walther PPK! You Only Live Twice incorporated many style elements of Ian Fleming’s literary James Bond, blended with the trends of a later decade and the template set for Sean Connery’s 007 to deliver a fashionable and fitting summer business suit for Bond’s visit to Osato’s office. Bond’s blue suit in You Only Live Twice would be the last Fleming-esque blue-suited outfit of the series for decades until Daniel Craig’s sharkskin suit for a Moroccan gunfight in Spectre, which I’ll be featuring in a few weeks as we get closer to Ian Fleming’s birthday. 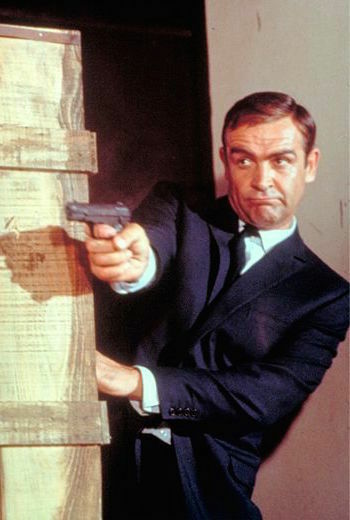 Even non-firearm enthusiasts knew by You Only Live Twice that James Bond famously carried a Walther PPK in his shoulder holster. In fact, the year after the film was released, Walther developed the PPK/S model for importation to the United States after the passing of the Gun Control Act of 1968. The U.S. was Walther’s largest market for the PPK, doubtlessly due to its popularity as Bond’s sidearm of choice, so the Walther PPK/S was developed to meet the parameters for legal importation into the country. It’s thus very questionable that Blofeld would be able to deduce from Osato’s x-ray machine that: “only one person we know uses this sort of gun: James Bond.” Not only is this a very silly supposition due to the fact that this is one of the most popular firearms in the world, but also because two of Blofeld’s own SPECTRE agents – Vargas and Count Lippe – had used their own Walther PPK pistols in the previous film, Thunderball, and Dr. No had established the PPK as the well-known sidearm of the CIA! Look out, Q, Osato’s got some fancy gadgets as well. The confusion is compounded in the following scene, when Bond draws his sidearm for a gunfight at the port of Kobe and it isn’t a Walther PPK at all, but rather appears to be a cosmetically different Colt Model 1903 Pocket Hammerless pistol. The early Bond films are known for making quite a few forgivable firearm-related errors, but to swap out the hero’s trademark weapon leaves some questions. A PPK had actually been used earlier in the film, so it’s not that the filmmakers didn’t have access to one as was the case for Dr. No. PPK or not, Bond’s pistol serves him well when he gets into a sticky situation. Helga: Mr. Osato believes in a healthy chest. I cant respond to your mails on Bond and others clothing on film, but I’ll let you know I read your posting with delight.